Regular readers may remember back in August I did a review of the Jersey Barriers from Tiny Worlds Wargaming. I was rather taken with them. Not just because they were awesome but because they were awesome and an incredibly reasonable price – rather blowing the doors of comeptitors pricing models like a bunch of rampaging wargaming socialists. And bloody good for them because the disparity between some companies and others is baffling. But I digress. So not content with producing some rather awesome barriers, Tiny Worlds have been busy producing three sets of Dragon Teeth Tank Traps. Factory fresh, slightly knackered, and totally stuffed – much like the barriers. And much like the barriers they’re rather impressive. Now one might ask how much gushing can any one man do over some resin tank traps. Well quite a lot really because of the following reasons. 1. They look superb. As with the barriers, the tank traps graduation from new to annihilated is considered and reasonable. Nothing about it scream apocalypse weapon which is good because these barriers are designed for modern to sci-fi games. And the goods news is that they’ll fit in with World War II games as well. Huzzah! 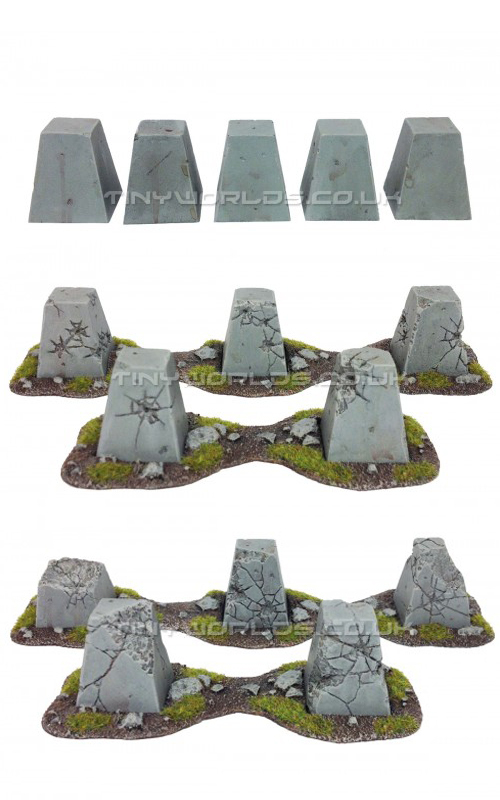 The damaged and ruined sets also come with bases that you can place you tank traps on to make them look more scenic. This is way cool as it helps tell the story but it also means that you can buy other sets and swap them out – providing you don’t glue them down. 2. They’re immaculately cast. And I mean perfect. Not a hint of flash anywhere and no oiliness from the release agent. Underside of each trap is also completely level. The care with which these traps were cast is actually a bit mad, especially when you consider the price. A set of five teeth will set you back a measly £5.50. £6.50 if you want the way cool base. And why wouldn’t you? For a single shiny pound extra the bases look nice but aren’t so overwhelmed with detail that you won’t groan when you’ve finished your traps. And, thinking about it, they can be the beginnings of a cool scenic/display base for a warband or some such. Added value if nothing else. 3. They’re versatile. And not just in the obvious sense. They’re designed to git on a sci-fi or modern game board, and as mentioned they also work with World War II and, wait for it, Fantasy. They can act as stone posts for chain fences, which, assuming you use real chains, make for a very flexible terrain piece. But thanks to the perfect casting and tidy geometric design you can create some fairly Elvish waystones. Granted if you opt for a damage waystone you’ll need to select those traps that don’t look obviously shot up. But even that can be explained away to a point. Use one of the natty three slot bases, fill in the middle one and with a couple of sets of traps you can have a pretty cool looking High Elf gateway, magic portal…thing. Thinking about it further and with a steady hand you could fairly easily do something similar for some Necron structures. The Dragon Teeth Tanks traps from Tiny Worlds are just brilliant. Simply designed, elegantly executed and perfectly casted. And for the price I doubt there’s a better set of 28/30mm tank traps on the market.